In the pantheon of great rock musicians, one figure is often excluded. Sister Rosetta Tharpe, who wailed on the electric guitar before Elvis Presley or Chuck Berry were even fully grown adults, has gone largely unheralded since her roaring career in the 1940s. As a bold black woman who sang gospel music in nightclubs and got church audiences dancing in the pews, she was an eccentric figure in her time, but she has since been crowded out in the collective memory by newer, flashier acts. 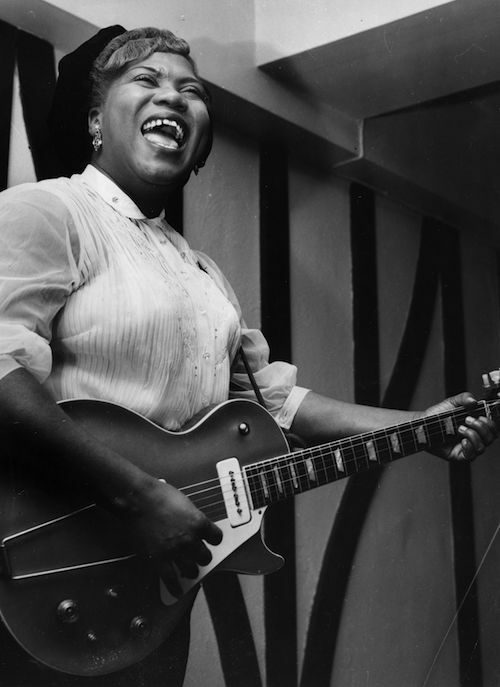 But historically, rock music starts with Sister Rosetta, and its history is incomplete without her. Rosetta Nubin grew up in Arkansas with music all around her, including a singing, mandolin-playing mother and membership in a black evangelical church that encouraged worship through song. At age 4, she joined her mother onstage, guitar in hand; by age 6, the hype was already building around the “singing and guitar playing miracle” touring with her mother’s group of traveling gospel performers. At age 19, she married a Pentecostal preacher, Thomas Thorpe, and although their marriage soon fell apart, she adopted a variation of his surname as the stage name that would follow her over three decades and as many marriages. Like so many musicians, Tharpe moved to New York City, which quickly escalated her career. Her inclusion in the Christmas 1938 "From Spirituals to Swing" concert series at Carnegie Hall marked a breakout moment, when her name was billed alongside established jazz musicians like Count Basie and Big Joe Turner. She was a regular at music venues around town, especially at the Cotton Club with Cab Calloway and Duke Ellington. Decca Records signed Sister Rosetta to record four songs, which comprised the company’s first-ever gospel offerings, and all four were met with widespread acclaim. This marked the first occasion a faith-based singer garnered widespread praise from non-religious listeners. “That’s All,” recorded during that time with Lucky Millinder’s orchestra backing her, was Tharpe’s first recorded performance on the electric guitar—the instrument that would soon become her calling card. By the 1940s, Sister Rosetta was considered a superstar. Her first two decades of album releases consistently delivered hits. In 1945, “Strange Things Happening Every Day” hit No. 2 on what is today known as Billboard’s R&B charts. “Down By The Riverside,” a huge crowd-pleaser around the same time, was selected almost 60 years later by the Library of Congress for inclusion in the National Recording Registry as an example of the unique, spirited style that influenced so many musicians to come. When a Billboard music critic used the term “rock-and-roll” in 1942 to describe a distinct style of music, he was using it specifically to describe Sister Rosetta Tharpe. For a lifelong church-going woman, Sister Rosetta was extremely liberal in her choice of performing venues. She played churches and secular clubs alike, including New York City venues with mixed-race audiences, which both energized and scandalized listeners. As if it weren’t enough to see a black woman put herself forward as a performer—on the electric guitar, no less—Tharpe intentionally played for audiences of saints and sinners alike, singing about heaven on Sunday mornings and wanting “a tall skinny papa” on Saturday nights. Various anecdotes indicate that she cursed freely, wore pants, and engaged in relationships with women as well as men, none of which she considered at odds with her personal faith, no matter how many fingers and tongues wagged. Tharpe was comfortable in the role of a true rock star, making appearances in high heels and rhinestone-embellished dresses that belied the rip-roaring performance she would unleash with just a Gibson guitar and her own powerful voice. She split her time between two houses and, like any great musician of the era who had “made it,” drove a flashy Cadillac. When Tharpe married for the third time in 1951, her flair for showmanship informed the wedding celebrations. The ceremony took place outdoors at D.C.'s Griffith Stadium (then home to MLB team the Washington Senators) before an audience of 25,000 paying ticket-holders. The packed stands of well-wishers were treated not only to the thrill of a celebrity wedding, but also to a one-of-a-kind performance by Tharpe in her wedding dress, followed by fireworks overhead. The backlash from conservative members of the Christian community took its toll on Tharpe, who eventually wilted under their disapproval of her ungodly music. She had spent much of the 1940s teaming up with gospel singer Marie Knight to record traditional favorites, and the two became famous for their duets, including “Up Above My Head,” which charted at No. 6 during the height of their collaboration. But shortly after her extravagant nuptials, Tharpe made a mostly innocuous career move that ultimately had terrible consequences. Having paid sufficient tribute to the spirituals on which they were raised, Tharpe and Knight deviated from their established songbook and recorded a secular blues album—which flopped. Their still largely religious fanbase took this new direction as an affront to the church, and the disapproval was keenly felt as Tharpe’s audience dwindled. Tharpe’s waning popularity in the United States drove her to seek greener pastures in venues around Europe, after she was first invited to tour the UK with trombonist Chris Barber and his band. She continued to enjoy a modest following across the Atlantic, but fell increasingly into obscurity as she was overshadowed by Mahalia Jackson, the new grand dame of gospel. A crop of young, white men whose rocking and rolling was indebted to Sister Rosetta’s trailblazing style were, however unintentionally, making her more faith-based music seem old-fashioned and retrograde. She continued performing through the '60s, but in 1973, at age 58, she died after suffering a second stroke. The Godmother of Rock 'n' Roll was buried in an unmarked grave in Philadelphia—her husband had failed to provide a headstone. Until her death, Sister Rosetta remained a powerful singer, belting loud enough to match the amplifiers that she insisted on setting to full volume. Musicians like Johnny Cash and Little Richard grew up on the sound of her voice, both citing her as their favorite singer. Jerry Lee Lewis, Aretha Franklin, and Tina Turner also credited her sound and stage presence as formative influences on their own careers. Interestingly, critics have suggested that Tharpe's broad appeal may actually have contributed to her faltering legacy. Because Sister Rosetta could call no single genre—not gospel, not blues, not pop, not rock—her own, history has left her stranded without any genre at all. Nevertheless, Tharpe was influential beyond her mere talent as a singer. Gordon Stoker, leader of Elvis’s backing band, spoke about how her innovative, expert style of guitar playing inspired The King. 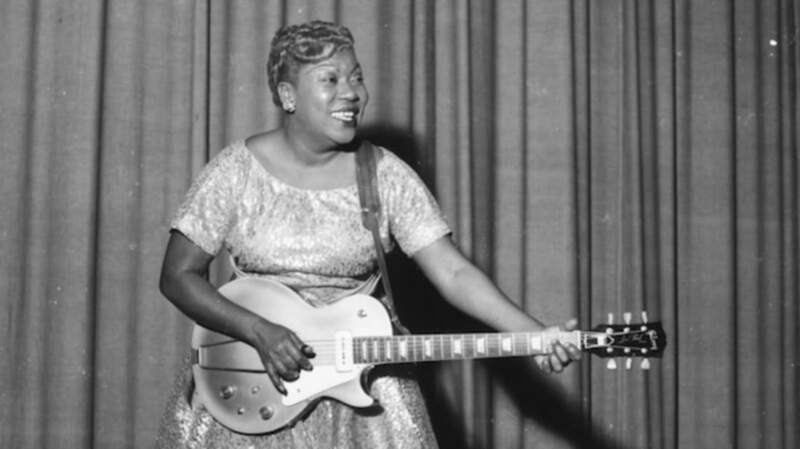 In Stoker’s words, Tharpe’s picking stood out “because it was so different.” Her 1944 take on “Down By The Riverside” demonstrates the extent of her virtuosity, as she tears into a pulsating solo that foretold the rhythms that rock 'n' roll would popularize. Bob Dylan aptly summed her up as “a force of nature.” Her proto-rock influence was such that an audience in Manchester, as she launched into her rousing rendition of old gospel standard “Didn’t It Rain,” began to clap—on the backbeats. The Guardian suggests that this may have been “the first recorded example of that phenomenon in a land where mass clapping on the first and third beats of the bar had hitherto been a deadening ritual.” Sister Rosetta didn’t just have soul; she coaxed it out of others. As successive generations of hitmakers themselves grew older and old-fashioned, music historians began to take notice of Sister Rosetta once more, in light of her profound influence. In 1998, the postal service issued a commemorative stamp featuring her smiling broadly, a sign of the momentum that built up to her posthumous, much belated induction into the Blues Hall of Fame in 2007. In 2008, January 11 was declared Sister Rosetta Tharpe Day by the state of Pennsylvania, which later granted her former home an official historical marker. In 2009, the proceeds from a benefit concert organized by a fan funded the purchase of a headstone for Sister Rosetta, engraved with the title “Gospel Music Legend” and a quote from her friend Roxie Moore: “She would sing until you cried and then she would sing until you danced for joy. She helped to keep the church alive and the saints rejoicing."